It is important to remain vigilant in the world of scepticism – but we can still have a little fun. I love this article written by Mike Bastasch in “The Daily Caller” – “Top 5 ‘Snow Free and ‘Ice Free’ predictions”. This is not climate change – this is just cold weather. In the antipodes they are having record heat, that is ‘hot weather’. It happens. You would think the prophets of doom would get tired of being wrong. I have just published a book entitled “To Kill an Error”. It is my attempt to popularise the sceptic view of Global warming. I have written it as a novel – a thriller (I like to think). There are any number of books around (I have read quite a few) that state a case for the sceptic point of view. They appeal to people like me with a knowledge of the subject. What I felt was missing was something that might appeal to the agnostic. 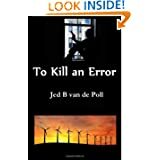 In the factual books the subject matter can be very dry, I have wrapped the message up in a murder mystery that I hope stands alone but in addition gets across some of the darker side of the rush for Green Energy.